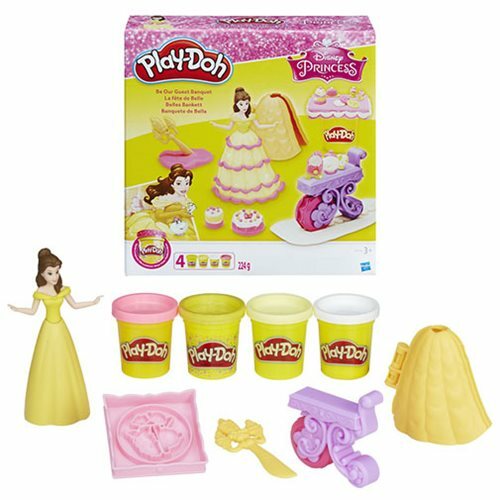 Join Belle and all of her friends for a delightful pretend dinner party, Play-Doh style! Get Belle ready for the occasion by creating her ball gown with the book-mold. Make it glitter with the included Play-Doh sparkle compound! Create make-believe banquet snacks and accessories with the tray, then pop it on top of 1 of the 4 Play-Doh cans to double as a table. Decorate for the party by rolling out lovely ribbons with the teacart, which also stamps out Mrs. Potts and Chip. Lumière is also here to help decorate with his half-mold and knife accessory! Ages 3 and up.